Why is nuclear power the core climate change solution? 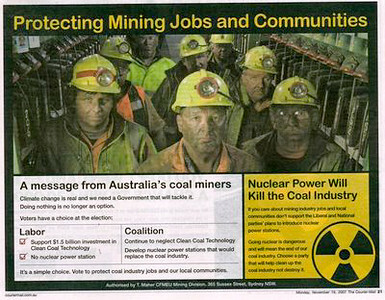 January 2010: Trying to get my head around nuclear power issues. I would describe myself as a nuclear “agnostic.” But the more I read the more I can see the merits of Barry Brooks’ (and your) point of view, and realizing we’ve lost a lot of time bringing nuclear power online. I too was “agnostic”, but leaning against more nuclear generation. I was concerned about all that long-lived “waste”. Why do we need nuclear power — my optimistic-self wanted to believe Ray Kurzweil that “nanotechnology” would somehow enable solar to become the answer for clean, affordable energy. Or geothermal, wind, tidal, or bio-something. As I studied energy policy it became clear that a necessary condition that must be satisfied by carbon-free energy is that it must be “cheaper than coal“. Otherwise, the dominant future polluters, the developing world, will continue building coal power stations. After 25 years of government subsidies, the results for “renewables” just don’t add up — not even close. Certainly, there are geographic niches where the free market will adopt wind or solar, but on a global basis, pushing for such “renewables” just prolongs the dominance of coal (and gas). The Big Green NGOs and Green parties have lost the plot — they have forgotten that the goal is to achieve zero emissions, not to promote particular popular technologies. As you say “we’ve lost a lot of time bringing nuclear power online”. Instead of being coal-dependent, both America and Australia could easily have adopted the French model, which with almost entirely nuclear-based electricity generation, makes France the standard for other developed countries to achieve (the challenge for the rest of the planet is to catch up to where France is today!). Sigh… The good news is that China does not seem to be that stupid. So — what solid information can we offer that is useful to our friends? For foundation reading I recommend David MacKay’s famous energy policy book “Sustainable Energy Without the Hot Air” . Dr. Mackay is now Chief Scientific Advisor to the UK Department of Energy and Climate Change. You can follow some of David’s efforts here, and you can find Seekerblog posts on MacKay’s work with this search. (…) It is my conclusion, from all of this, that nuclear power IS the only viable FF [fossil fuels] alternative. 3. The developing world lives in Trainer’s power-down society already, and they are going to do everything possible to get the hell out of it. The developed world will fight tooth and nail, and will burn the planet to a soot-laden crisp, rather than embrace Trainer’s simpler way. Power down is a non-solution to the climate and energy crises. When you see anti-nuclear propoganda, always ask yourself “Who Benefits?” And yes, the following is exactly our objective — to kill all coal fired generation (except for CCS plants, if they can make it work). China already has 9 GWe operating, with 61 GWe new reactors planned, including some of the world’s most advanced. Their goal is least 60 GWe (total) by 2020, and 120-160 GWe by 2030. China demands aggressive technology transfer in their contracts — e.g., in return for the large commitment to Westinghouse AP1000 reactors, China will be building and supplying most of the components after the first two plants are completed. India expects to have 20 GWe nuclear capacity on line by 2020 and 63 GWe by 2032. It aims to supply 25% of electricity from nuclear power by 2050 [I think this goal is much less than India is likely to achieve]. India is a leader in Thorium Fast Breeder (FBR) technology and could turn out to be a major global supplier of new nuclear plants. (…) India has uniquely been developing a nuclear fuel cycle to exploit its reserves of thorium. Now, foreign technology and fuel are expected to boost India’s nuclear power plans considerably. All plants will have high indigenous engineering content. India has a vision of becoming a world leader in nuclear technology due to its expertise in fast reactors and thorium fuel cycle. Russia is producing some 22 GWe in 31 plants, including the BN-600, one of the longest operating fast breeder reactors in the world. Russia has another 37 GWe of new capacity under construction, planned, or proposed. Brazil has about 2GWe power by two Siemens plants at Angra, and 8GWe more planned for 2030 and 60GWe total by 2060. The bad news is that there will be many megatons of coal burned before this turns around. This entry was posted in Climate Change, Energy Policy, Favorites, Nuclear Power and tagged Anti to Pro Nuclear, Cheaper-than-coal, David-MacKay, Nuclear Power, Steve's conversion to nuclear by Steve Darden. Bookmark the permalink. As of last year, the spent fuel from a Fast Breeder reactor with a burn up of 155 GWd/t was reprocessed, re-fabricated as new fuel and loaded back into the reactor. This marked the successful closing of the fast reactor fuel cycle, a key milestone. Current efforts are underway to commercially scale the benefits of Thorium energy to all Indians and to the rest of the world. First, we should recognize the contribution that India is making on many different fronts towards a sustainable, carbon-free energy source. India’s advances on the Thorium cycle are not well-reported – so any links you can share on commercial scale Thorium would be helpful. Also, I would greatly appreciate a link/URL for the Fast Breeder reprocessing milestone that you quoted. Link to a speech by Atomic Energy Commission (AEC) Chairman Srikumar Banerjee speaking of the Fast Breeder reprocessing milestone I mentioned. Agreed that information on India’s Thorium cycle is not readily available nor has anyone really taken the trouble to consolidate it neatly in a single source. I recall reading somewhere about there being over 60 different government agencies/ departments/ ministries etc working on various parts of the Thorium value chain. With the recent entry of private players (as well as the entry of India’s Big Oil companies like Indian Oil) in this space, the field has become even more crowded. My own interest in this topic can be traced to the fact that my dad was a nuclear engineer and he worked at the Trombay power plant for many years. To collect information from diverse, scattered sources, I have been a news aggregator junkie, having subscribed to several thousand news feeds over the past 7-8 years. Thanks for the Banerjee link. I am speculating that India has an opportunity to export and operate nuclear generation, with a technical lead in the Thorium-fueled arena. AFAIK India is not working on LFTR designs, at least not to the prototype stage. Correct? I’m pleased to see another RSS user. I do not agree that “Twitter has killed RSS”. Past couple of years, DAE India has unveiled the design of two reactors AHWR and AHWR-LEU, both in the mid size (300 MWE) range. The AHWR is mainly a thorium-fueled reactor meant for internal use, not for export. It represents a stage 3 reactor i.e. it uses as input the U 233 produced from Th 232 (stage 2) and should be situated in relative geographic proximity of the Stage 2 Fast Breeders. It has been designed, developed, validated and currently in production with a target of 2012. The basic design of the AHWR-LEU was revealed domestically in 2008 and to the international community at Vienna in Sept 2009. It runs on a unique fuel mix that appears to combine the features of all three stages i.e. low enriched Uranium (stage 1), in-situ conversion of Th to U (it breeds U 233 from Th, a stage 2 process. Because this is a once-through process, some have labeled it a “passive breeder” reactor) and also uses the converted U as fuel (stage 3). The AHWR-LEU promises a host of safety, waste management and anti-proliferation features, a design life of 100 years with “plug and play” convenience. This is the reactor meant for export and it is said to be in “development and validation” phase at the BARC with a hard stop of 2020 for achieving complete commercial viability. Not sure of the answer to your LFTR question, although I vaguely recall a mention of it in one of the DAE publications. Let me see if I can find the reference. I like Twitter for its pulsating, real time street coverage but still prefer the more sedate depth and breadth of RSS.